A great superheroes game! The perfect superhero mystery game for Halloween parties or anytime! Cron and his evil team of villains have been captured in the downtown area of this city. The Police Chief says they found details of a diabolical plan in their hands. Humble as they are, no superhero has come forth to receive the praise for this, so it is our job to work out which one is responsible for this marvelous deed. Cron and his evil team of villains have been captured in the downtown area of this city. The Police Chief says they found details of a diabolical plan in their hands. Humble as they are, no superhero has come forth to receive the praise for this, so it is our job to work out which one is responsible for this marvelous deed. 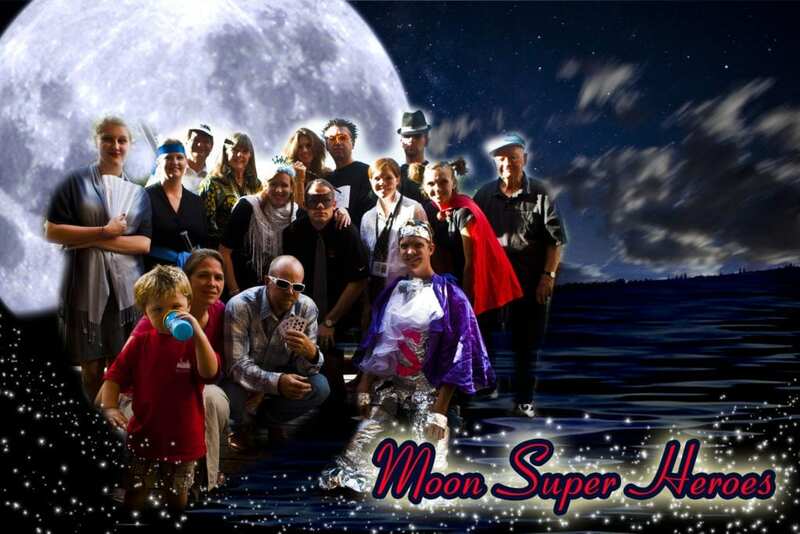 See Annette’s photo above from her Moon famiy gathering to do “The Superhero Mystery” party. 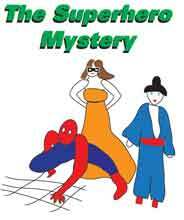 In your email, you asked how I found the Super Heroes Mystery. We have enjoyed several of your party kits in the past so when I was looking for a mystery party kit for our family reunion, I immediately went to the Merrimysteries website to find another fun party kit. We have had such fun in the past with Murder on the Prairie, Celebrity Celebrations, Storm Survivors, and Balmy Bahamas. I love that you write good clean fun plots. As I looked through the different choices, I finally decided on the Super Heroes party kit and we had a ball! Most of the family had experienced one or more of your mystery parties before but for others, this was their first experience. Everyone was so excited to participate. Our oldest granddaughter (17 years old) took part this year as well as my husband’s 93 year old father. Each person came prepared with great costumes and ready to play their part to the fullest. We laughed and laughed as family members really got into their characters and questioned each other. It was fun to listen to them debate who really was the super hero. Thanks for producing such fun entertainment. This was the fifth mystery party kit we have purchased from you and we plan to purchase more! Thanks for helping to make our reunion such a fun success! We plan on doing another mystery party at our next reunion!! Keep writing more kits! I’m like those eight-legged creatures, except I am only feared by those on the wrong side of the law. I am a very practical lady. I do all my own mechanics and I am a technological genius. Sometimes I get myself in sticky situations, but I always end up the winner. With the aid of my infrared vehicle, I can see things at night that others can’t see. I crusade for goodness. I stop those who should be resting in their graves from prowling our streets and wrecking havoc on the undead. I’m Nightflier’s associate. I’m a technological whiz kid. Without my help, he wouldn’t be as famous as his is. I’m a Japanese warrior of great renown. I own seven very special blades and sometimes I have them all going at the same time and it’s just like a fan. Morrow – I’m the masked man from Monaco. I’m known throughout the world as the defeater of the evil-souled ones. I am Samurai Sally’s constant assistant and friend. Don’t let my demure looks fool you as to my abilities. I am a possessor of incredible strength. I am the defeater of all who choose to do the wrong thing. I glide through the night sky with grace, elegance and skill, defeating all who dare to do wrong. I’m always the first to arrive at any crime scene. I’m a serious lady that no one is able to defeat.